Romania badly needs a stable government to emerge from the aftermath of Sunday’s elections. Last week’s parliamentary elections in Romania produced the clearest electoral majority in the country since the first post-communist elections in 1990. Gabriel Badescu writes that the magnitude of the Social-Liberal Union’s victory raises a potential issue for Romanian democracy, with the coalition now holding enough seats in parliament to pass a constitutional amendment. The Social-Liberal Union’s co-habitation with President Traian Băsescu also poses an obstacle to delivering the effective governance needed to revive Romania’s struggling economy. This year has been an unusually busy one in Romanian politics. It began with street protests against austerity in January, followed by the toppling of two governments backed by the centre-right president Traian Băsescu, which were replaced by the centre-left Social-Liberal Union coalition (USL) through a vote of confidence in April. Then the local elections in June were the first clear signs of the magnitude of erosion in popular support for the centre-right Democratic Liberal Party (PDL), which had been in power between December 2008 and May 2012. The second half of the year was marked by USL’s failed attempt to unseat president Băsescu, followed by a constitutional crisis that attracted criticism from the European Commission and the United States on the methods used by the government in handling the crisis, which were considered as threats to democracy and the rule of law. The end of the year will see a new Parliament, after 9 December’s elections, the seventh in the 23 years since the fall of Romania’s communist regime. These latest elections show once more that the rules and provisions of the Romanian electoral laws have suceeded in creating a rather stable national party system, where competition is centered around a few major contenders that coalesce to form governments. The number of political actors, parties or electoral coalitions, that succeeded in entering Parliament on separate ballots declined from 16 in the 1990 legislative elections to four in 2004: a number that remained unchanged in 2008 and in the current elections. Moreover, four of the parties from this legislature were in the Parliament from their initial creation: The Social Democratic Party (PSD), the largest Romanian party in the post-communist period, and one of the two successors of the Romanian Communist Party; The Democratic Liberal Party (PDL), the other successor party, but one that shifted its ideological orientation in 2005 from left to the right; The National Liberal Party (PNL), the only historical party revived in 1990 that managed to survive as a parliamentary party for two decades; and The Democratic Alliance of Hungarians in Romania (UDMR), an ethnic alliance of the Hungarian minority, that has been present in all the post-communist parliaments and in almost all governments formed since 1996. 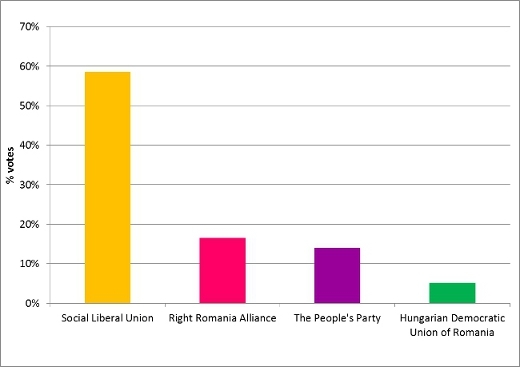 PSD and PNL entered the current legislative as part of an alliance (the Social Liberal Union or USL), and are the overwhelming winners, as shown in Figure 1 above, with 60 per cent of the votes, an unprecedented success for a Romanian political actor since the 1990 elections. PDL, as part of an alliance with two new right wing parties, Right Romania Alliance (ARD), is on a distant second position, with 17 per cent of the votes, whereas UDMR took 5 per cent of the votes. Given this long term stability and closure of the national party system, it is surprising that a party created only one year ago, The People’s Party – Dan Diaconescu (PPDD), succeeded in attracting 14 per cent of the votes. With a populist platform and led by the owner of a lowbrow TV station currently under trial for blackmail, PPDD is the only party that had a significant increase in both relative and absolute vote share since the local elections in June. Two other significant outcomes of these elections can be linked to the type of electoral system, which is a modified mixed-member proportional system for both chambers. One is a function of the system not being entirely proportional and tending to favour large parties or alliances. As a result, the share of seats received by USL exceeds the two-thirds majority required for amending the Constitution, raising concerns that it may follow the example set by the Orban government in Hungary in trying to eliminate the remaining institutional checks on its power. The second is that the allocation system determined an increase in the total number of seats by 25 per cent, an outcome that is deeply unpopular and is likely to deepen the public’s disenchantment with the political process. This is especially true given that in a referendum on modifying the size and structure of the Parliament held on November 2009, 89 per cent of voters were in favour of a reduction of the previous size by more than one third. The severe defeat suffered by the PDL was not unexpected, since it was the leading governing party over a period that included a deep recession in 2009, when the economy contracted by 7.1 per cent, and promoted pro-cyclical austerity measures, including a 25 per cent cut in public salaries. The fact that both the PDL and USL had received about the same number of votes in June’s local elections suggests that in the last couple of months political parties did not enjoy significant success in changing voting preferences. Nor, as various surveys show, did they manage to inform the public on what distinguishes them on the most salient economic and social issues. Austerity policies and views regarding president Băsescu were the major (closely interrelated) issues that predicted votes. No significant differentiation existed among parties on environmental policies, church-state relations, gender discrimination, Roma issues, sexual minorities, nor even on how to deal with an abysmal rate of absorption for EU structural and cohesion funds. Romanians hope that the next year will bring less drama in the political arena and that the two years until Băsescu’s term ends in 2014 will bring a more peaceful cohabitation between the main political actors. At the same time, they wish that the new governing elites would be more effective in dealing with pervasive corruption, wastefulness and clientelism. Romania, the EU’s second-poorest member state after Bulgaria, with an average monthly wage of $450, about three million Romanians working abroad, and a 2012 growth forecast that has recently been revised down to 0.9 per cent from 2.5 per cent, badly needs a stable government and more efficient governance. Gabriel Badescu is an Associate Professor in the Faculty of Political Science and Public Administration, and Chair of the Political Science Department at Babes-Bolyai University. He is also Director of the Center for the Study of Democracy.